Hey guys! 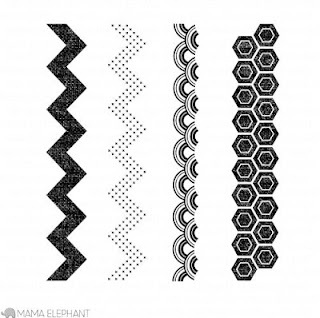 We're back today with the new Mama Elephant set called Modern Borders! These borders are so much fun to work with and really easy to create a custom background. I chose to the hexagon pattern to work with for my first card. If you look closely, the design has a textured look to it. Gives a cool look and it's very forgiving to stamp (who doesn't love that;). 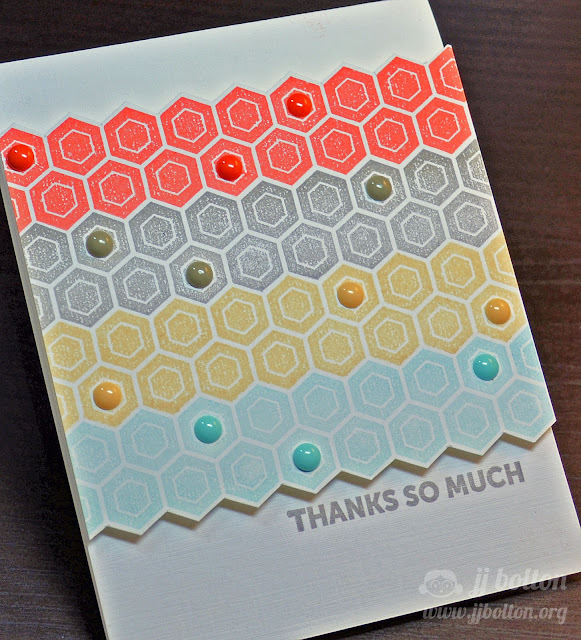 I stamped the hexagon stamp 4 times in colors to match my enamel dots. I love that the dots fit right inside each hexagon center. It's the little things that make me happy:) I fussy cut the panel and mounted it over a linen card stock base. I like the fact that the base has a bit of texture too. The sentiment is from the Say What set and has the perfect modern look to match the hexagons. My next card uses the wave pattern from Modern Borders. 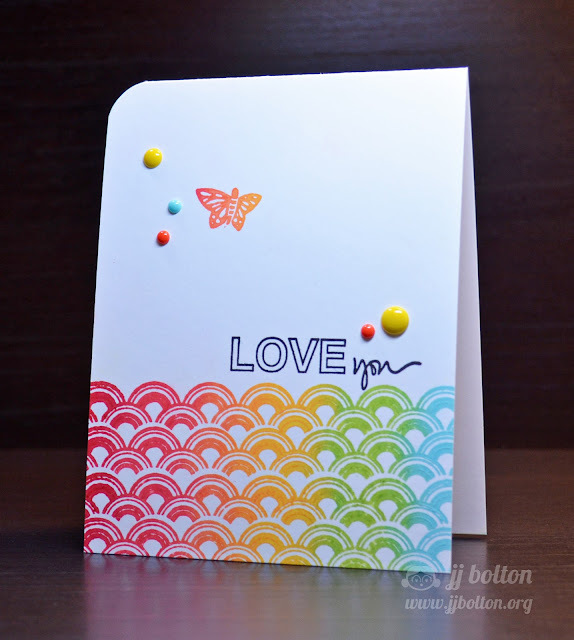 To get that rainbow look, I used my custom rainbow ink pad. I custom made this ink pad using Ranger Cut-n-Dry stamp pad foam sheet and reinkers. The pic below shows 2 of my custom ink pads. I keep them in a small flat container that used to hold herbs from the market:) Am I the only one that takes things out of the recycling can for crafty purposes? If you're thinking about making your own ink pads, just remember pigment inks work better with stamp pad foam and dye inks work better with stamp pad felt. I strongly suggest you check the instructions and do a little experimentation. That's it for me today! 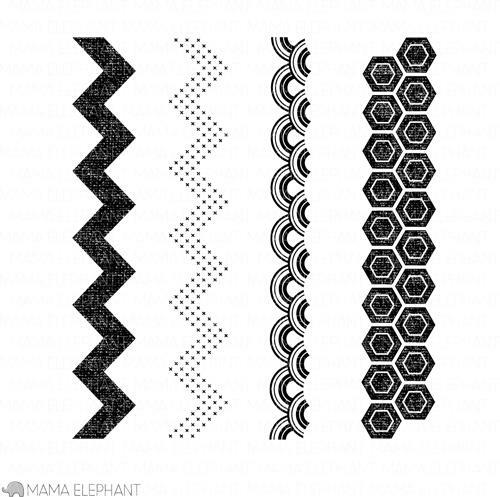 Definitely go check out what the other Mama Elephant team members are doing with this great set! Come back tomorrow for one more highlight from the February release! Have a lovely day! 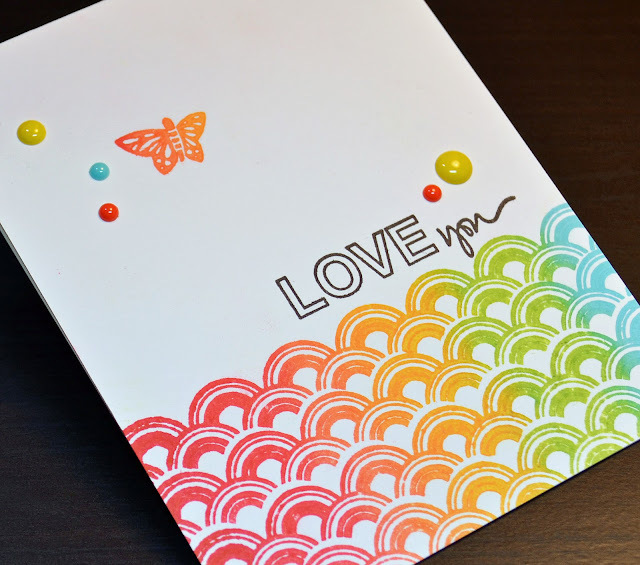 DIY rainbow ink pad awesomeness! Looks fabulous, JJ! 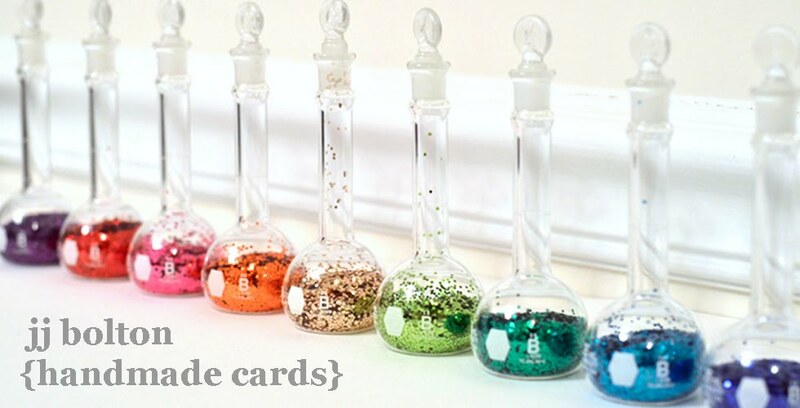 Wow--love your cards and your home made ink pads. Such a clever gal. These are both very pretty! Love that you've created your own rainbow ink pad!! Great cards JJ! You are totally working those enamel dots! Oh wow JJ - don't make me pick - you know I love the bright rainbow colors but the first one with the perfectly matched enamel dots is calling to me!!! 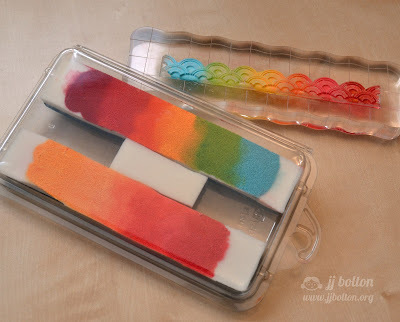 So clever to make your own rainbow inkpad - looks fantastic and looks so cool and tropical! TFS your homemade ink pad. Great cards too. Awesome awesomeness JJ! Love the hexagons of the first but the rainbow inked card is just a complete beauty!! The whole post I was nodding my head "uh-huh" ... I'd get happy if enamel dots fit inside a hexagon, love the texture on the hexies, modern font looks great with the hexies, and I would have been super proud of myself for not hoarding enamel dots too. Plus, your homemade ink pad is so fun, glad you shared it! What is it about those little enamel dots? I lurve 'em. Wonderful cards and fab ink pads...now I will be saving my containers too! Awesome cards, JJ! Thank you for showing your DIY ink pads too! So cool!